Living in San Francisco has brought on so many small and large lifestyle changes. For example, I no longer have daily access to a car like I did in Los Angeles so I’ve had to rely on public transportation to get to places. Although it takes longer to get to my destination, I can use my commute time to nap, listen to music, peruse instagram/pinterest/blogs or read magazines. It’s also cheaper and more environmentally-friendly so for the most part, it has been a welcome change! Another small lifestyle change is the way I shop for my food. Working at the Ferry Building Farmers Market once a week has opened my eyes to the plethora of beautiful produce and artisan products that the Bay Area has to offer. It’s wonderful to know where your food came from and to know that it wasn’t sprayed with smelly, potentially cancerous chemicals and then driven hundreds of miles in the back of a truck that passed through dust and manure particles. Okay I may have just described a fictional scenario but I’m pretty sure it actually happens sometimes! I’ve resolved to buy organic and local products when my budget allows me to, especially if I’m eating something raw. I’m also trying to learn about what’s in season and buying seasonal produce. (How SF of me, right?!) Well, guess what’s in season right now? FIGS! 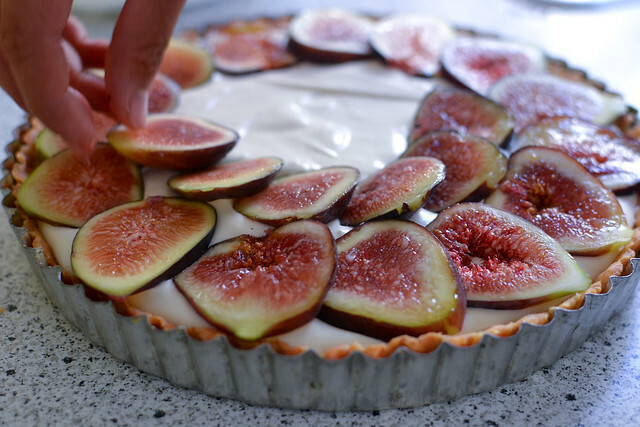 They’re incredibly delicious on their own (if you pick the right ones), but are also great and beautiful in tarts, so naturally I did some experimentation in my kitchen and came up with this tasty fig mascarpone tart topped Marcona almonds! Small confession: I’ve never had a fresh fig before until about a month ago. I grew up in the Philippines where figs are unheard of and my only experience with them involved imported Fig Newtons which my undeveloped, inexperienced palette thought were disgusting. I actually didn’t know that a fig was a fruit! 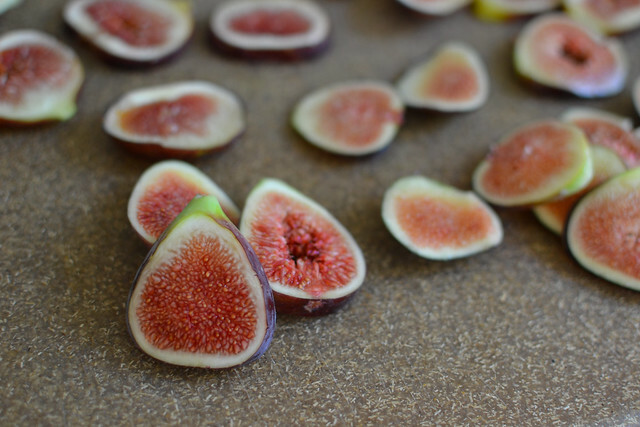 I came across some fresh figs while strolling through the Inner Sunset Farmers Market one morning and fell in love. 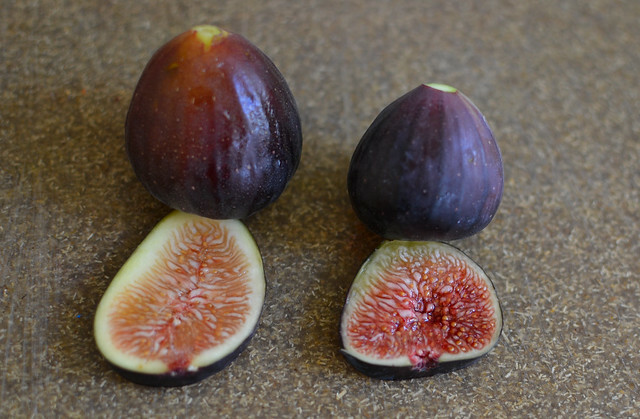 Pictured above are the two types of figs that I’ve tried, the brown turkey (left) and the black mission (right). I personally prefer the brown turkey fig, which is less earthier and a tiny bit subtler than the black mission. 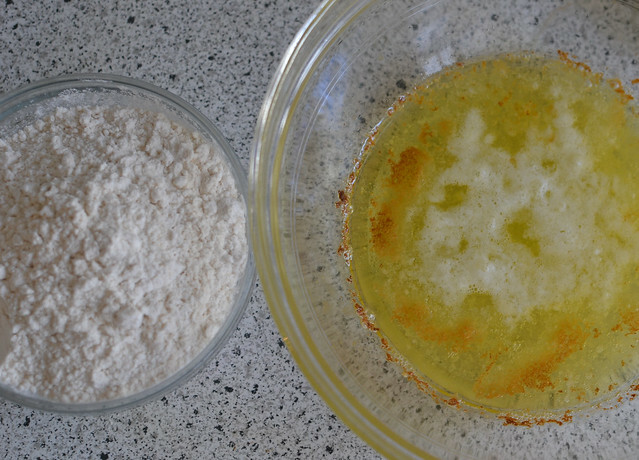 I decided to use a mixture of both in my tart. 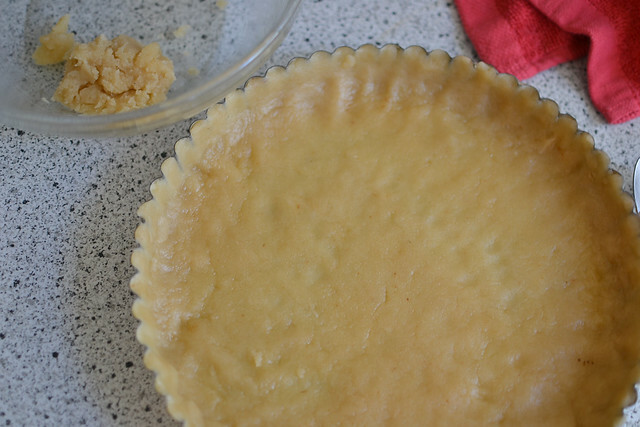 I’m not much of a tart baker and wanted a crust that was simple and easy to make. 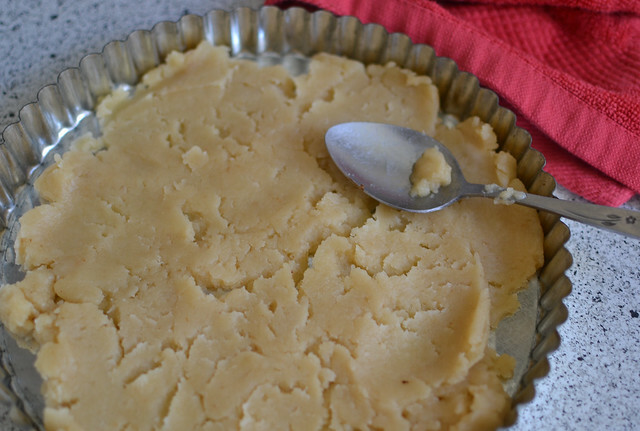 After searching online, I came across a simple French tart dough recipe on David Lebovitz’s site. I made it twice and the second time around, I made some small changes that yielded a crust that I was happy with. The ingredients are simple and the instructions are straightforward. 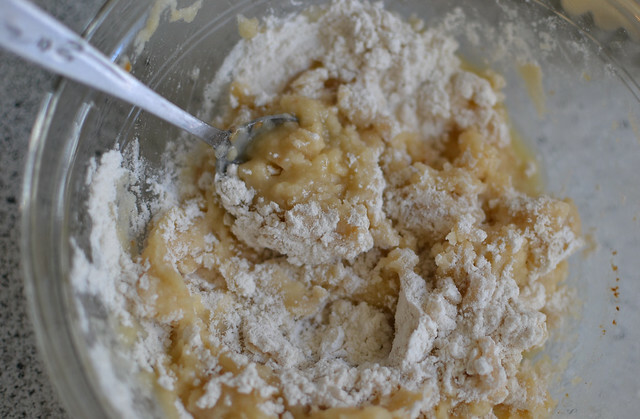 I used 170 grams of flour and left my butter mixture (butter, oil, water, sugar, and salt) in the oven for 20 minutes. I might go even a little longer next time to brown the butter more. Brown butter is one of my favorite things! 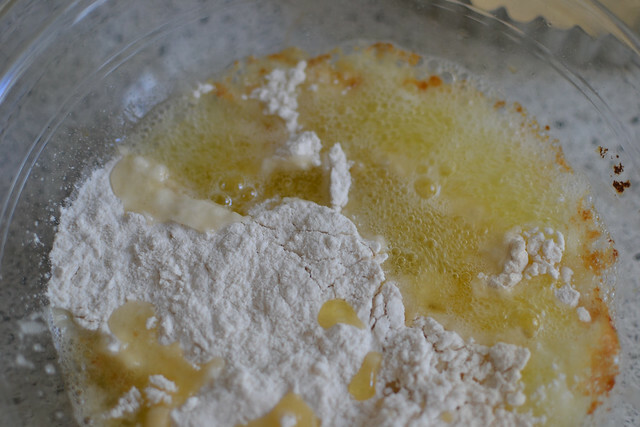 Pouring the flour in the butter mixture brought me back to my organic chemistry days of bubbly reactions. Once cool enough to handle, I used a spoon to spread the dough on a 9 inch tart pan with a removable bottom. Make sure to really cover the edges and don’t forget to reserve some dough for patching little holes later. Bake in the oven until golden brown and use the leftover dough to patch up the some holes and then let cool. 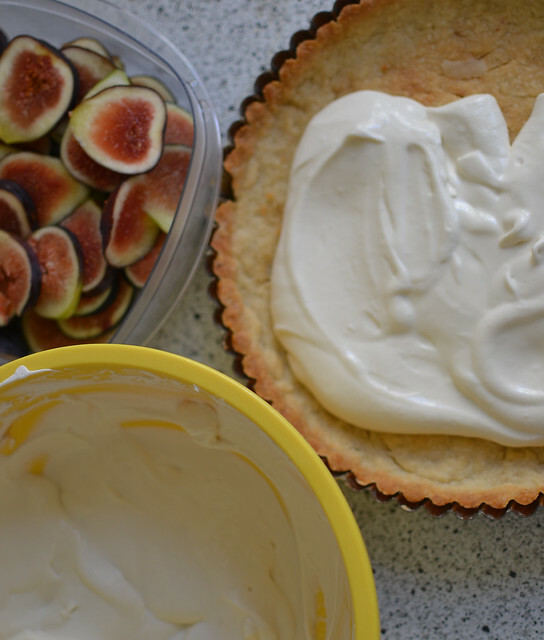 Throughout the butter boiling and crust baking process, I prepared the figs. 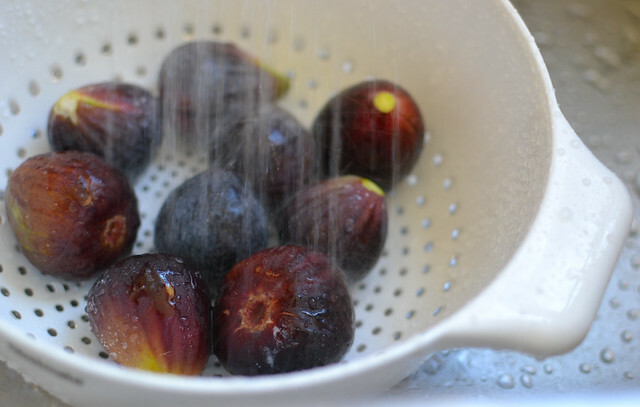 I gave them a nice little shower in the sink and then pat them until they were completely dry. Then I sliced them to about 1/4 inch thickness like so. And then snapped a bunch of photos because they are just so darn beautiful and photogenic! Whip the whipping cream until you get soft peaks and set aside in the refrigerator. Whip the mascarpone and sour cream together until creamy and blended together. Add the whip cream and mix with a spoon or spatula. Add the brown sugar and mix until combined. Use your taste buds to adjust the flavors to your liking! 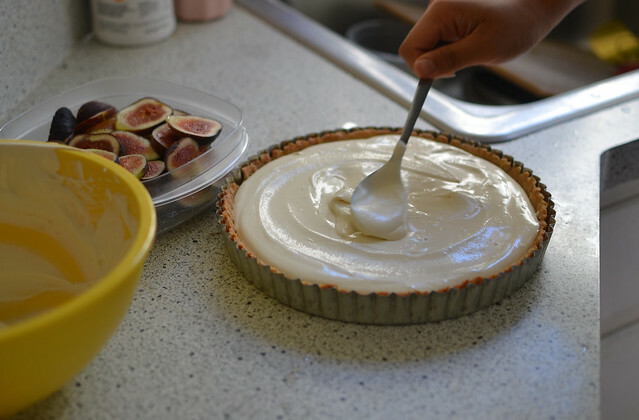 Keep inside the refrigerator until ready to assemble tart. Spread the filling generously. I didn’t use all of the filling and stored it in my refrigerator. It’s a good dip for the leftover figs and strawberries! 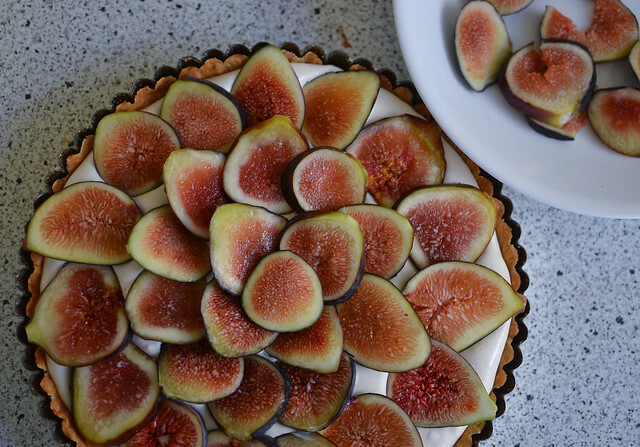 Feel free to place the figs on the tart however you want to. This is where you get complete creative freedom. 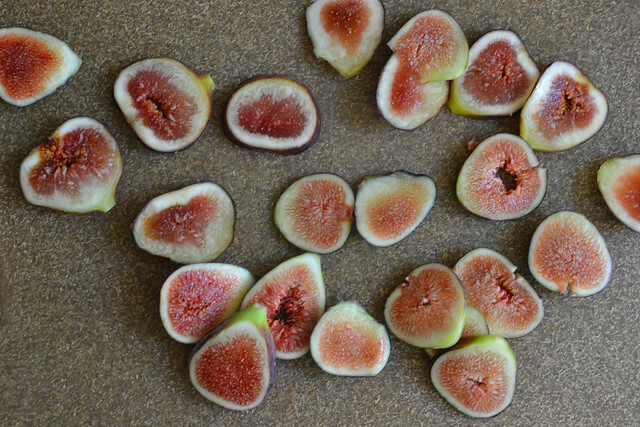 I arranged the figs with the stem side facing outwards and starting with bigger, brown turkey figs on the outside. 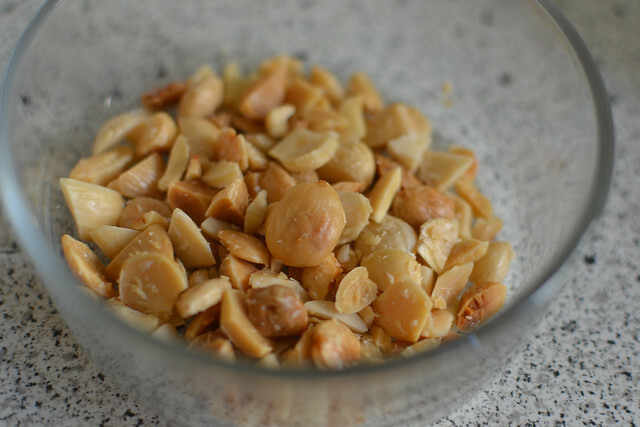 My coworker suggested sprinkling some chopped up Marcona almonds (which can be found at markets like Whole Foods, Andronico’s or Bi-Rite) on the tart for added crunch and saltiness. It was a brilliant idea and definitely elevates the tart! 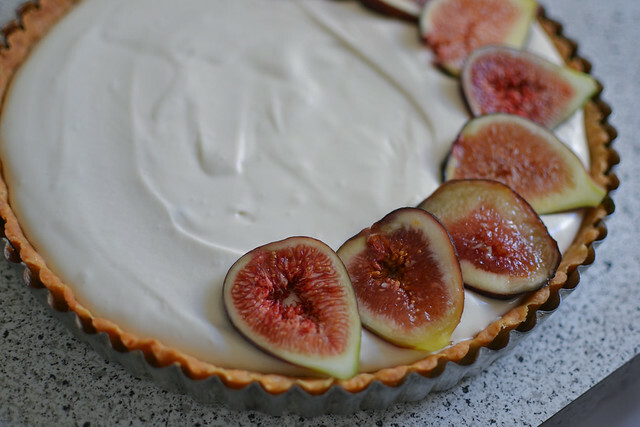 The tart is best served chilled, preferably outside just before the sun sets for perfect photography lighting because you’ll want to snap photos of this beauty. It’s creamy but not too heavy, with the right amount of sweetness, saltiness and crunch. 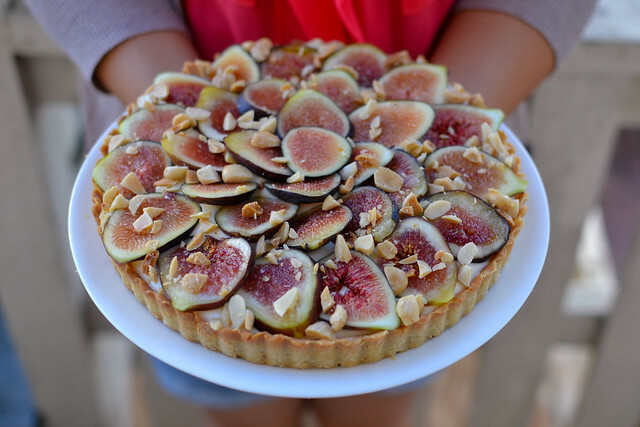 I hope you have a figgin’ good time making this tart, because I sure did!